Buying for warmer climates? 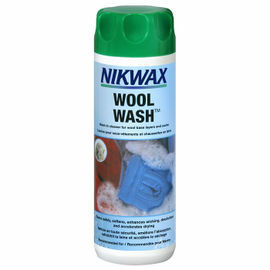 Please take a look at our Woolpower - 200g range. 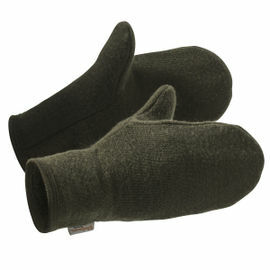 Woodlore have been proudly stocking Woolpower's woollen garments since 2003, and have no plans of stopping. Their range of base- and mid-layer thermal tops and leggings come highly recommended by both Ray and the entire Woodlore Team. They have become a staple item of our overseas winter expedition kit lists, and are equally important for use back here in the UK. 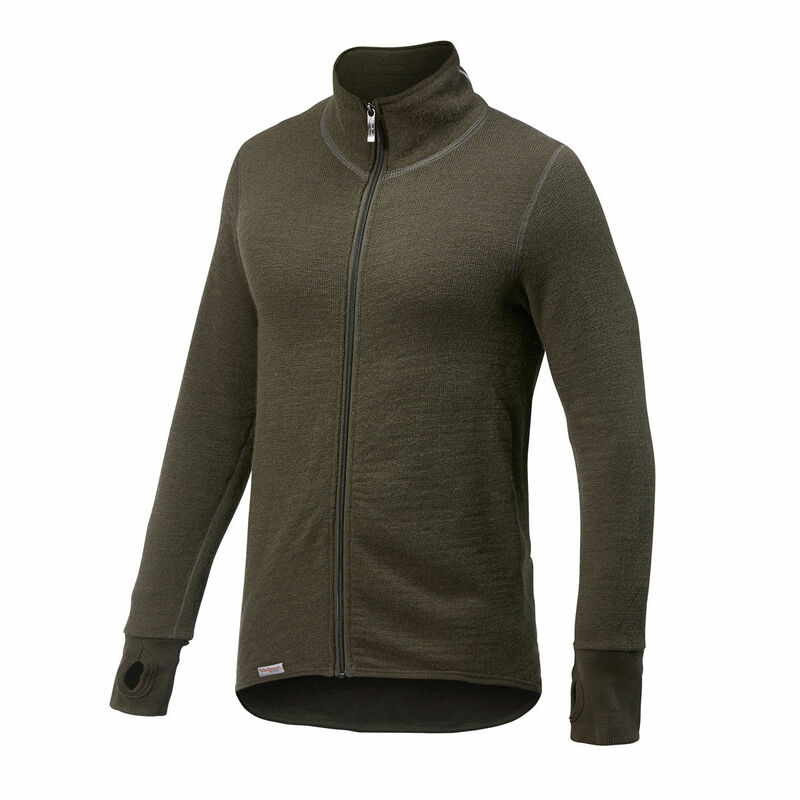 Woolpower Ullfrotte Original Full Zip Jacket - 400g - Green is rated 5/5 based on 13 customer reviews. This is a great piece of kit. It is snug fitting and quite 'stretchy' making it very comfy to wear. It feels nice on the skin and did not itch me at all around my exposed neck. Arms are not overly long when not using the thumb holes, and not so short they pull when you are using them. I have only worn it, so far, for one long weekend, so I cannot say if it will last. It did however hold up fine on the first outing. When wearing it under a smock during the day, (over a thin cheap merino 200g top), at around +6, it was lovely and warm but not too hot. When worn with an insulated jacket added at night (-2 and sitting around), it did an excellent job of keeping me warmer than i would have been, based on past experience. It fits nice and long in the body (I am 6'1 and slim and have a size medium). It covers up the lower back brilliantly. It has never ridden up when bending to work or lift and carry. It did not smell at all after three days of constant wear (even wore it in a sleeping bag at night). I aired it out as recommended, but it really did not seem to need it. The only thing I am not so keen on is a big metal zip pull dangling around the neck. It works fine, but for military wear it is a bit reflective, and as a mid layer it would be better with a material zip pull to avoid you mixing it up with the zip pull on the top layer. Overall, it looks and feels like a quality item, it is nice to wear and does the job very well. I look forward to its next proper outing. It looks quite smart and is so comfy that I have taken to wearing it about the house. I am very disappointed in the product and sent it back for a refund. There are 3 reasons: 1) I would never buy something with a huge brandname logo since I find it tacky. Nowhere do the photos show the sweater from the back, where 'Woolpower' is emblazoned across the collar. 2) The size S was huge for a small and I have 2 others of the same brand to compare it to. It was not a small and I almost wonder if it was mislabelled. 3) The colour looks like a much brighter green online (except for the thumbnail, which is more accurate and I saw after ordering). It cost me over $40 US for two-way shipping to end up with no sweater. Please make a note of these remarks for other customers. To not show in the photos that there's a huge logo just doesn't cut it. It's a deal-breaker for me. Thank you. Dear Leta. Thank you for your comments on the Woolpower 400g Jacket. We are updating the product description to reflect your comments. Also, please bear in mind that the 400g products are sized slightly larger than the 200g products as they are designed to be worn one over the other. Thank you for taking the time to send in your review and we will get your return processed immediately upon its arrival. The Woolpower full zip Jacket is very, very warm. 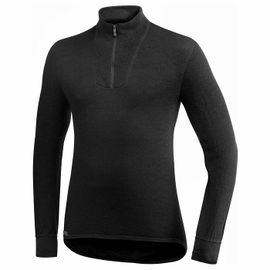 I am absolutely delighted with this; it is warm, comfortable and the full zip makes it very versatile. I have recently returned from birding and walking in West Wales and it performed fantastically well on its own in unseasonably cold, windy conditions, and was very comfortable under a smock when it rained. I bought the 200g model as well and the two together under my Ventile smock will be my winter go-to I think! Service once again was excellent and a minor order problem was sorted promptly with no fuss. An excellent company that has earned my trust through the quality of the products it sells and the high level of service. 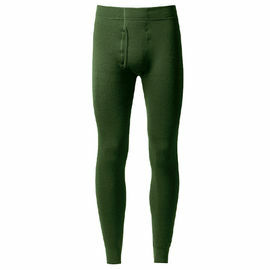 Just the best merino mid layer you can buy. Wrong size was sent but they replaced with a new one the next day with great efficiency. A pleasure to shop here. Great top, surprisingly warm, shame it doesn't have front pockets. Made and sewn in Sweden? Sure it is. And perfect fit as well! Quality and attention to detail. Comes with the name of a seamstress who assembled this jacket! Warm and comfortable. Wearing it to work, at home and outdoors. High collar is so effective that I don't have to use scarf. I am a Woolpower fan now. Thanks for this excellent product. Thought this was a lot of money for a 'jumper' but now I've tried it I won't wear anything else. So soft and stretchy and always seems to be the perfect warmth, whatever the conditions. I have been converted to a Woolpower fan! No more synthetic fleece for me. I'm now a Woolpower fan. This is lovely and warm, and fits well; I often have trouble with tops being too tight around the arms and armpits; this top is roomy enough. It is long cut so bear in mind your outer shell will need to accommodate this, or you risk it popping out from underneath.